At last, tax reform is happening! Last week, President Donald Trump celebrated the passage of the most important legislation so far of his presidency. The final bill falls far short of the “file on a postcard” promise of Trump’s campaign. It even falls short of the bill trotted out by Congressional Republicans just a few weeks ago. It is, nevertheless, the most significant tax overhaul in more than a decade. Corporations and most individual taxpayers will see lower overall rates. That’s the good news. Unfortunately, there is also some not so good news investors need to be aware of. Because no spending cuts will be attached to “pay” for the tax rate reductions, the legislation will grow the budget deficit by an estimated $1 trillion to $1.5 trillion over the next decade. The actual number could end up being smaller…or bigger, depending on how the economy performs. But more red ink will spill. The GOP tax bill is effectively a debt-financed stimulus package. It will boost economic growth in the near term while saddling taxpayers with larger long-term debt burdens. He’s referring to tens of trillions of dollars in unfunded Social Security and Medicare obligations. They are all but politically impossible to tackle, except through the voodoo of new debt and currency creation that will keep benefits flowing with devalued dollars (i.e., inflation). The expected increase in the budget deficit and boost to private sector economic growth from tax changes have the potential to combine for an inflationary outcome. More growth means more demand for manufactured products and the raw materials that go into them. Higher deficits mean more newly created dollars will get pumped through the financial system and eventually make their way into the real economy. Higher rates of inflation work against investors (and work for the government) in numerous ways. For one, the government gets to tax any nominal gains realized on assets artificially boosted by inflation. Even when assets appreciate less than the inflation rate (and post losses in real terms), the government can still tax the artificial gains. Another “inflation tax” hazard for investors is winding up in higher tax brackets due to nominal increases in income. Wages and/or investment income that rise merely to keep pace with inflation can push taxpayers into higher rates of taxation (the new tax bill modestly lowers rates but keeps the same bracket structure). The difference between chained and unchained CPI is small in any given year. 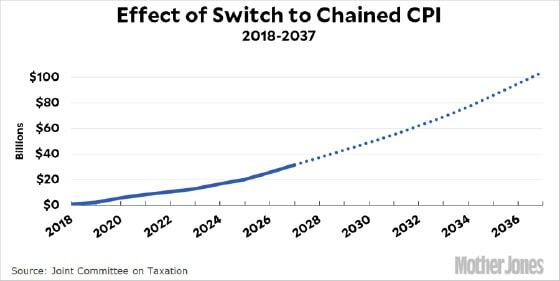 But according to the Joint Committee on Taxation, this obscure little change will cost taxpayers (and benefit the government) over $30 billion through 2026. That’s because chained CPI usually comes in lower than regular CPI. Both CPI figures understate real-world inflation through under-weightings and statistical gimmickery. Congress has substitutes in the more inflation-understating version of the CPI. It will function as a built-in gradual tax hike without the need for any member of Congress to go on record as being in favor of higher tax rates. Under the new tax law, the standard deduction gets boosted up to $12,000 for individuals and $24,000 for married couples. It, too, is set to rise in accord with chained CPI. To the extent that the standard deduction fails to keep up with inflation, taxpayers who take it (which will be the vast majority), will see the real value of that deduction steadily fall. It’s another stealth tax increase that no politician will have to go on record supporting. Few taxpayers or political pundits even realize how these inflation taxes are baked into the new law. This isn’t to suggest that the haphazard and arbitrary mess of tax code was better or fairer before Republicans got their hands on it. It’s just to caution investors that there are both good and bad elements to the new law. The tax cuts will undoubtedly provide some stimulus to the economy and a boost to the net profits of corporations. That doesn’t necessarily spell more gains ahead for the stock market, however. Investors often make the mistake of buying on good news or, conversely, selling on bad news. By the time news is widely known, it’s often too late to act on it. Markets have been anticipating a tax reform package since they opened for trading following Election Day 2016. The benefits of the corporate tax rate reductions may already be largely – if not fully – priced in to the lofty U.S. stock market. Growth narratives are making headlines all over the financial media right now. The potential inflationary ramifications of the tax changes aren’t. Investors would be wise to hedge themselves against inflation as one potential side effect of the deficit-expanding stimulus the GOP will be injecting into the economy next year. Hard assets including precious metals may be among the unintended and unforeseen beneficiaries of the Trump tax cuts.